BBC NEWS | Technology | Is gaming really a 'lifestyle'? Is gaming really a 'lifestyle'? Why do people insist on shoving computer games in a tight yoof-related "lifestyle" box, asks Daniel Etherington of BBCi Collective in his weekly games column. 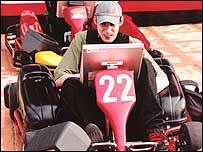 Do you actually want to play on a go-kart? Every time I see an advert on the London Tube or on the side of a bus for an event at Earl's Court, I picture smiley, smiley Carole Smillie's mug being used to promote the Ideal Home show. All the advertising for the PlayStation Experience, part of London Games Week, has just that effect. Is gaming really suited to this kind of treatment? On its posters, the PlayStation Experience, for example, boasts "the future of games, top bands, DJs, martial arts, celebrities, street sports and an exclusive Popworld special". Eh? How much of that has really got anything to do with games culture? You want martial arts, watch a chop-socky flick or join a club. Just because I have played and enjoyed Jet Set Radio, why on earth would I be interested in seeing "street sports" demos? Marketeers just do not really know how to place games it seems. Instead, they try to simply force various different yoof-related cultural activities into a bundle that vaguely adheres to gaming itself. Sure, there is more to game culture than simply playing the games. It is increasingly getting the intelligent attention it deserves in academic and critical circles for example - its addition to the Edinburgh Festival's roster this year is worthwhile acknowledgement of its value. Surely the bottom line is that gaming boils down to you. You are possibly on your own, joypad in hand, embroiled in the action, then maybe discussing your experience - quite likely online - and reading magazines or websites for ideas about what you might want to have a crack at next. That is the essence of game culture. It's not some "lifestyle" to be packaged and marketed - neither is DIY for that matter. It certainly does not involve rollerblading martial arts demonstrations. Daniel Etherington writes for BBCi Collective, exchanging views on gaming, music, film and culture.